Is it ok to undertake buses at traffic lights? 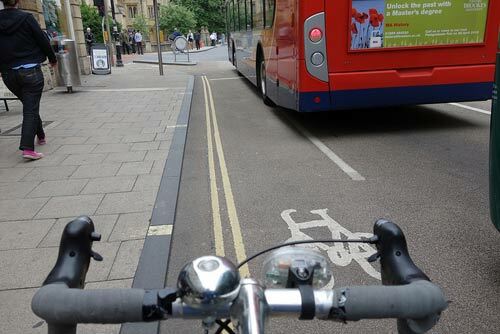 Cycle lanes known as ‘feeder lanes’ encourage you to go down the inside of traffic. In theory, you can move into the ‘advanced stop box for cyclists’. This gives cyclists a way to beat traffic jams and hopefully puts them in a visible position when the lights change. However, in practise when you get there, invariably you find a vehicle has stopped either totally or partially in the box. Also, the lights may change before you even get there, leaving you in a difficult position as heavy buses move off with you on the inside. I was interested to read the case of a cyclist recently fined for running a red light, when in fact all he had done was get to the advanced stop box to find a car in it. Because it was an awkward position he came to a stop in front of the white line. The police gave a ticket because technically he was running a red light – he stopped in front of the white line. I hope he wins his case because it’s something I’ve done myself. It raises a difficult question of whether it is ever good to go down the inside of stationary traffic at traffic lights? 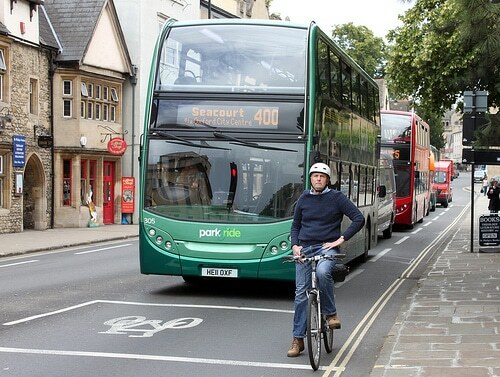 Cyclist squeezing down the inside of double decker buses on Oxford High Street. There is a brief cycle ‘lane’ near the traffic lights, encouraging this behaviour. When you cycle down the inside of large vehicles, you are entering their blind spot. It is easy for drivers not to see you. If a vehicle is turning left, you are at high risk of serious accident. Left turning vehicles into path of cyclists is a significant cause of fatalities. I always feel if you go down the inside, you have to be fully aware of the risk. If I’m confident of getting to the front of the queue before traffic starts to move, I may take it. 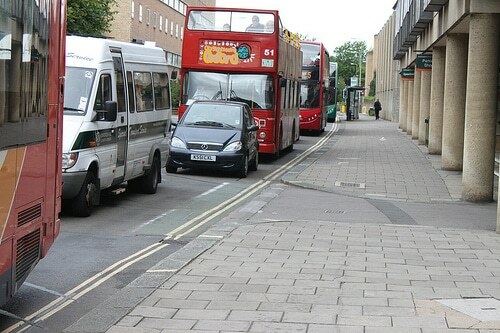 Sometimes I see cyclists go down the inside even when buses have started to move, this makes me feel very queasy as it is so tight and dangerous. The fact there may be a cycle lane painted on to the road is no guarantee. a rare example of vehicles respecting all the cycle lanes and advanced stop signs. From this angle, you can see the potential of cyclists getting to the front of the queue. The problem with riding on the inside of stationary traffic is that although it is potentially dangerous – it is also a superb way of beating traffic jams. This is one of the great attractions of commuting by bicycle. This kind of stationary traffic jam is common on Iffley road, and it feels relatively safe to go down the inside. But, it is worth pointing out cycling is common and drivers should be aware of cyclists because they are so common. But, even so you have to take great care and just because it is usually OK, doesn’t mean you have to squeeze through every gap. A little patience is important. You might be able to see a bit of a cycle lane here. It is partly hidden by buses and comes to an abrupt halt before the junction. On balance pretty useless. Cycle Routes and Other Facilities. Use cycle routes, advanced stop lines, cycle boxes and toucan crossings unless at the time it is unsafe to do so. Use of these facilities is not compulsory and will depend on your experience and skills, but they can make your journey safer. I’m glad the highway code states this. As sometimes I look at cycle paths and don’t fancy using them at all. Not everyone on the roads knows that cycle paths aren’t compulsory, but you have to use your common sense. 3 Responses to Is it ok to undertake buses at traffic lights? On my morning commute through Headington, you often get buses at a stop on the left, and another bus to the right, stopped at lights. When I see people squeeze down the middle it makes me think of the boat scene in Indiana Jones. Better to tuck in behind the bus at the lights, and when it sets off, you get a free tow.